December 20, 2010 June 5, 2015 / Julie Brook, Esq. Many attorneys, from business transactional specialists to family lawyers, are asked by their individual clients, “Should I file for bankruptcy?” This is not an easy question to answer, and is best responded to after analyzing many facts and issues. In fact, to answer it well, you’ll need to ask some questions of your own to determine the appropriateness of bankruptcy and the type of bankruptcy case to file. Why is your client considering bankruptcy? Make sure it is for a valid, good faith reason and is for a problem that cannot be solved by alternative means, such as negotiation. If it is to prevent a foreclosure or other creditor action, determine whether the automatic stay (11 USC §362) will apply. Obtain a complete schedule of all assets and analyze. Check for assets in other jurisdictions or an asset in which your client has a remote or contingent interest. Also, find out if your client may possibly acquire any property by inheritance, insurance, or marital settlement in the next 6 months (11 USC §541(a)(5)). Make sure to value assets at fair market value and to ascertain the status of liens and encumbrances against each asset to calculate equity. Obtain a schedule of all liabilities and analyze. Make sure that all debts are listed and analyze debts for dischargeability issues and advise your client on nondischargeability. Determine whether the amount of debt and the number of creditors justifies bankruptcy. Apply the “means test” to determine whether the debtor is even eligible for Chapter 7 bankruptcy. Analyze your client’s income and expenses to ascertain whether there may be substantial disposable income, prompting 11 USC §707(b) objection from the United States Trustee, which will trigger means test issues. Analyze the impact on third parties, e.g., guarantors or preference recipients. Parties who have guaranteed (or cosigned) your client’s debts will not be protected by the automatic stay and will be pursued by the creditor holding the guaranty in cases other than Chapter 13. Identify creditors to whom your client has made payments on account of antecedent debts, because the trustee may avoid payments under 11 USC §547(b) as preferences. Identify anyone who has received gifts or transfers without consideration, such as family members, because such transfers may be avoided by the trustee as fraudulent transfers. See 11 USC §§544(b)(1), 548; CC §3439.09. Consider whether reorganization or liquidation is appropriate. Discuss issues of your client’s spouse joining in the petition. Analyze whether the spouse is personally liable for any of the debt, or whether the spouse owns substantial separate property. Be aware of issues respecting separate and community property and determine if your client has any rights in the spouse’s retirement benefits. Determine an appropriate fee based on the complexity of anticipated issues and be sure to document what is covered by the fee. Consider any personal obstacles to bankruptcy or the attorney/client relationship, e.g., is your client candid and likely to cooperate, or are there likely to be issues of fraud, nondisclosure, or dishonesty? Have you performed all tasks related to the bankruptcy filing with due diligence? It is extremely important that you be able to do so, as you will have to certify all information provided in any bankruptcy filing as being accurate. See 11 USC §707(b)(4)(C), (D). For more helpful bankruptcy considerations, go to Debt Collection Practice in California, chap 12. 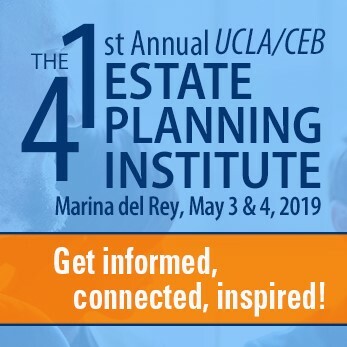 For a detailed discussion of creditor collection issues, including bankruptcy, turn to CEB’s California Estate Planning, chap 26. All of CEB’s bankruptcy resources are listed and described here.